1pHeat a large non-stick frying pan over medium-high heat. Add meatballs and cook, stirring occasionally, for 8 mins or until browned all over and just cooked through. Reduce heat to medium. 2Add the pasta sauce and cook, stirring occasionally, for 5 mins or until the meatballs are cooked through and sauce thickens slightly. 3pMeanwhile, cook the pasta in a large saucepan of boiling water for 3-4 mins or until just al dente. Drain well. Divide the pasta evenly among serving bowls. 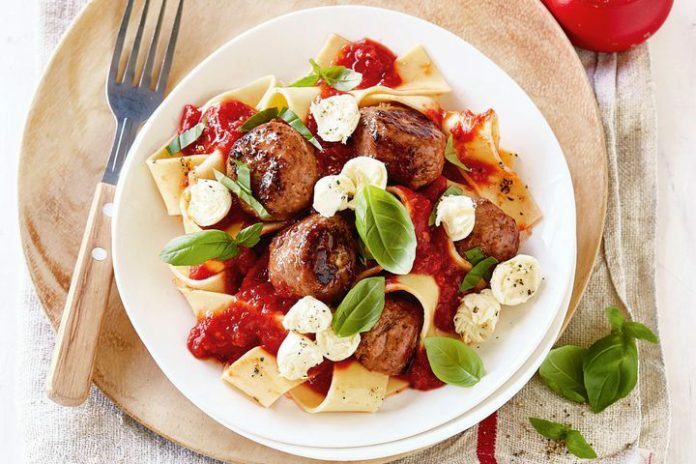 4Spoon the meatballs and sauce evenly over the pasta in the bowls. Top with bocconcini and basil. Season. Serve immediately.